Blind Shipping- Your Secret’s Safe With Us! We keep an ear to the ground and take serious interest in our customers’ suggestions and requests. 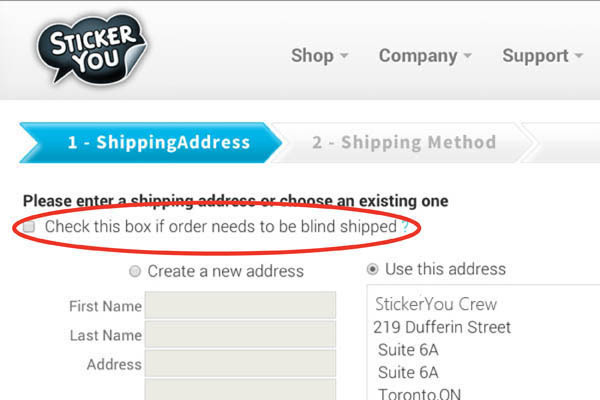 We recently had a lot of designers and other small businesses requesting a Blind Shipping option so their custom stickers and other products could be shipped right to their customers easily without it looking like it came from StickerYou. Kinda like when you pass off bakeshop items for your own culinary prowess. Not to worry- we are happy to oblige! Introducing the newest addition to StickerYou.com: Blind Shipping! This new feature allows designers and promotional companies to ship packages to customers without having to play the middle man. Instead of you placing and order, receiving the stickers and then having to package and mail out to your own customers, we will ship it right to their address instead. With this new blind shipping feature, there will be no StickerYou branding on the envelope or on the products itself and no invoice or billing information will be included. The order will look like it came direct from you. This means you don’t have to waste time re-packaging and paying for shipping a second time. Hallelujah! Great for small businesses and designers as well as gifts! So how do you do it? When your shopping cart is full and you’re ready to go, proceed to checkout. On the page where you enter the shipping address, there is a new check box just above the fields where you fill out your information. By checking the Blind Ship box, our shipping department will know to ship your package out devoid of any StickerYou Crew branding! All the recipient will see is a nice neat package full of stickers, temporary tattoos, iron-ons or more!